As I promised yesterday, here are the projects made at my June Stamping Technique Class. The theme was Big Shot Textures & Cuts. I totally love the new Framelits dies. So user-friendly, I just can't get enough of them. This first card uses the new Designer Series paper, Floral District (as do all the projects in this post), the Apothecary Accents Framelits, Delicate Designs Textured Impressions Folder, Large Scallop Edgelit, the Large Oval punch, and some Lucky Limeade 3/8" Ruffled ribbon. Bright and cheery! This next card is one I cased from my friend Kathy Howes, from a swap card that I received from her. So simple and yet elegant. With just a change of the Designer Series paper, the card can look very different. This card uses the Dsigner Frames Textured Impressions folder, XL Oval punch, Word Window punch, and Itty Bitty Shapes Punch pack, as well as some Baja Breeze seam binding and a Rhinestone Basic Jewel. 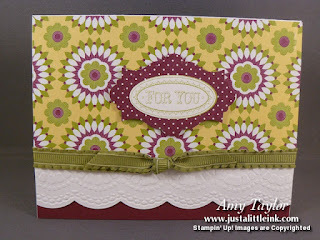 For the final card, I also cased this one from another demonstrator, Mary. The only thing I changed was the saying. Here I used the new set Itty Bitty Banners and the matching Framelits set, Bitty Banners. 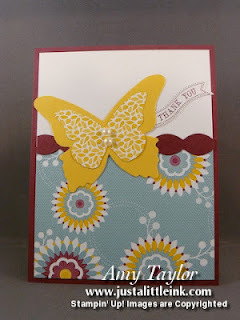 Everything else is done using the Sizzix Big-Shot and dies (Beautiful Butterflies & Tasteful Trim).